The Merge Output History for a particular file indicates the files to which the selected file has been merged. To view the Merge Output History for a file, select the file in the File List view and use the Properties tool button on the toolbar, or the Properties command under the File menu to display the Properties dialog. In the Properties dialog, select the Merge Output History tab to bring this tab to the front. The output history is listed per file rather than per session. 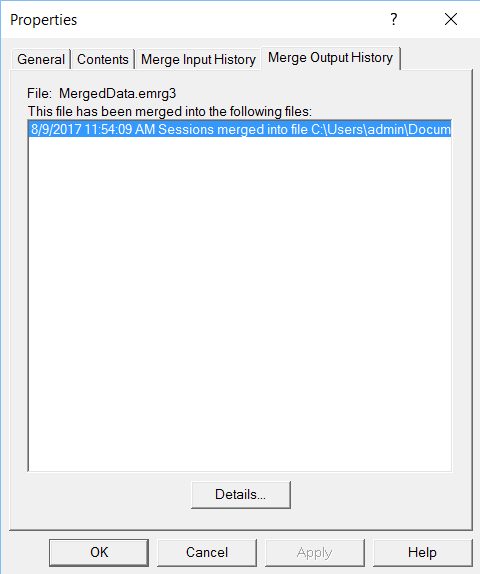 Therefore, the Merge Output History tab for a merged data file would not list the individual sessions of data contained within that merged data file. To view the individual sessions contained within a merged data file (and therefore output to the target file), select the data file on the Merged Output History tab, and click the Details button. 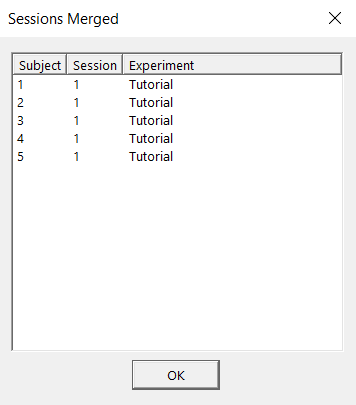 The individual sessions of data included within the merged file will be displayed.